We've been brainstorming delicious cocktail ideas while we dream of spring parties. On our extensive Pinterest binge researching cocktail ideas for our Vodka Cocktail post, we found some great cocktail recipes featuring rum! 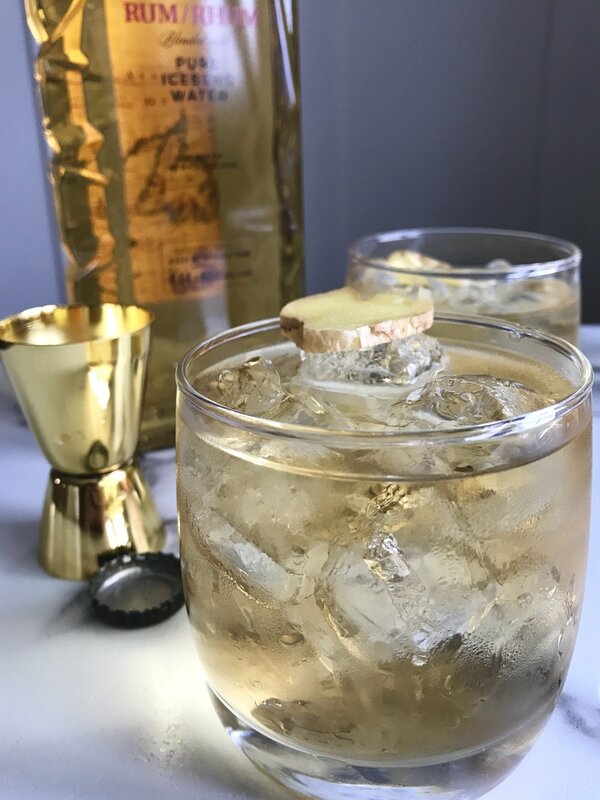 One of our go-to cocktails when we're out for drinks is a Dark & Stormy, so when we found a recipe for a Light & Calm we knew we had to give both a go! Keeping it local again, we stuck with Iceberg and used their Iceberg Silver Rum and Iceberg Gold Rum provided by Collingwood Wine and Spirits. Both rums are made with 100% Demerara Rum, aged in Guyana, then blended with pure iceberg water in Newfoundland. I have to be honest, both Jess and I love a traditional rum and coke once in a while - but we wanted to find rum recipes that would be perfect for Spring. All three of these cocktails are tasty, fresh, and pretty! Great for a party with friends or a girls night in. One of our go-to's on a night out and a classic drink that's sure to be a crowd pleaser! With a slice of fresh ginger for a garnish, this is a fresh and delicious mix that's sure to be enjoyed. If you're feeling a little more on the fruity side, switch up the Dark & Stormy for the more relaxed vibe of the Light & Calm. With a sugar rim and grapefruit juice it's a sweet treat everyone will love. Take your bartending skills up a notch and do a little muddling. We created a base of muddled strawberries and basil for this Strawberry Rum Smash. Topped off with a fresh rose, this drink might almost be too pretty to drink.